Sorry, your browser does not support embeded audio. Complete with motion-activated lights, HVAC "smart" A/C and LEED Platinum certification, the James Center is our smartest and most environmentally sustainable building on campus. 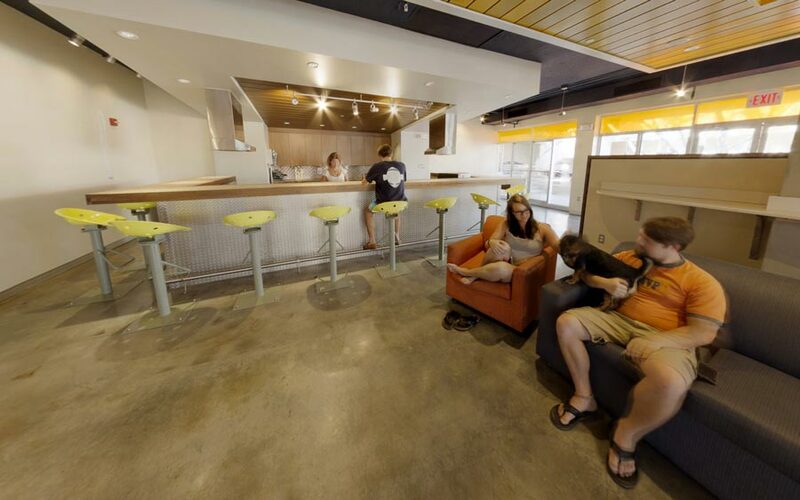 Plus it comes with a coffee bar for study breaks! 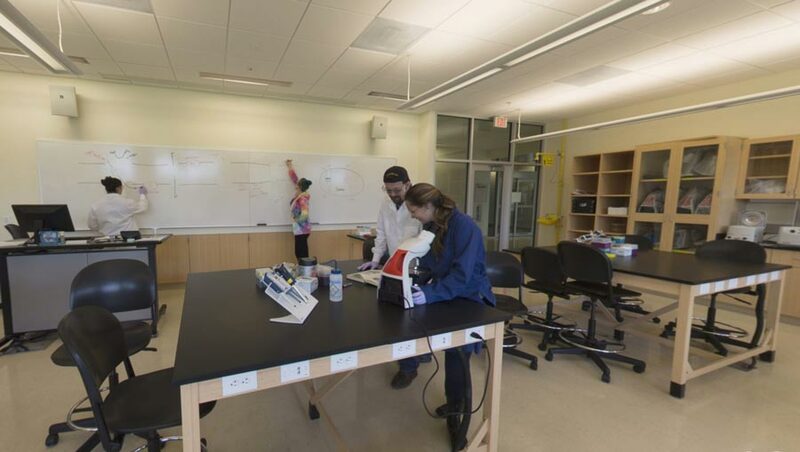 This teaching lab in the James Center is equipped with a million dollars' worth of new equipment for biology and chemistry classes. Celebration and relaxation convene at the Roberts Music Center patio on the southern bank of Fox Pond. Cobblestone pavers line the ground where students gather under shade trees to relax or study in harmony with the hourly chiming of Wireman Chapel. 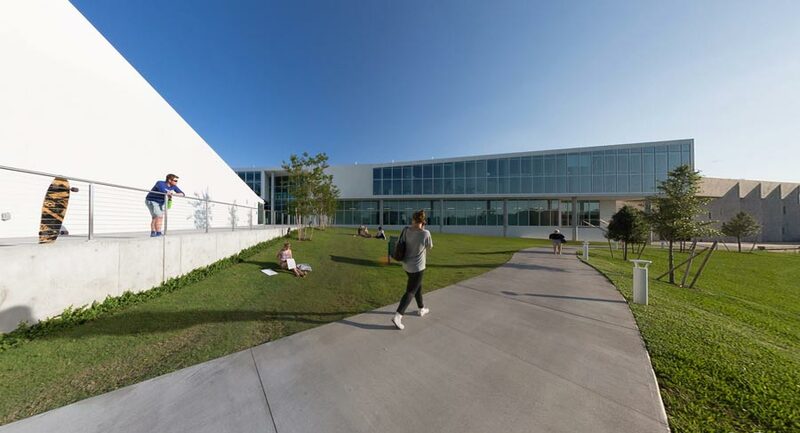 The 33,000-square-foot Nielsen Center blends into the campus"s natural beauty courtesy of large glass walls overlooking Fox Pond and unique outdoor features, including a ceramics and sculpture yard. 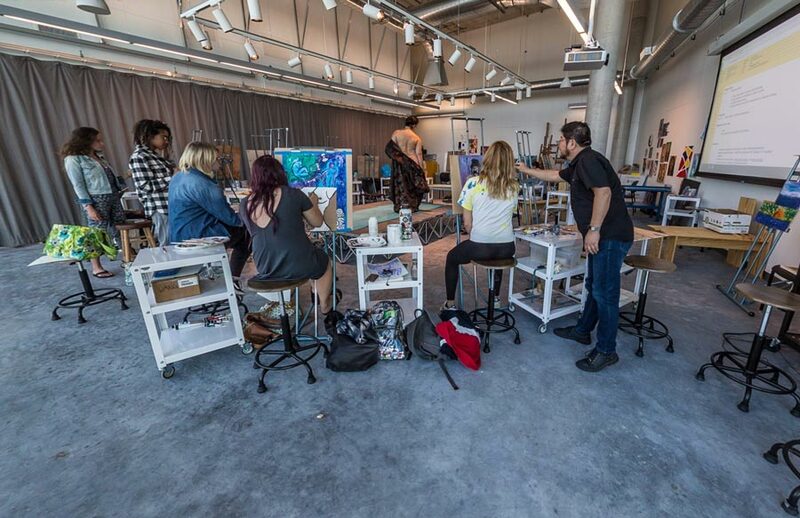 The Crane Painting Studio, in the new Nielsen Center for Visual Arts, is a premier classroom overlooking Southshore Grove and Fox Pond, with northeastern exposure and floor-to-ceiling windows to flood the space with natural light for inspired painting. 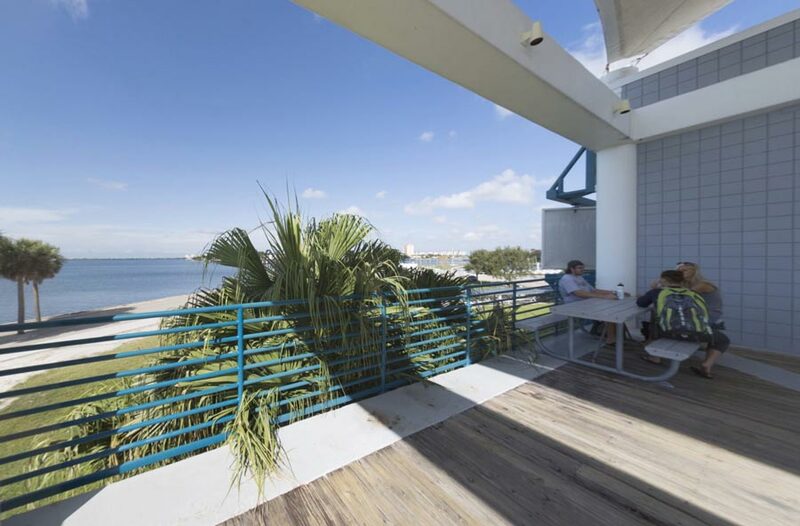 Galbraith Marine Science Lab's second floor deck overlooks Boca Ciega Bay. 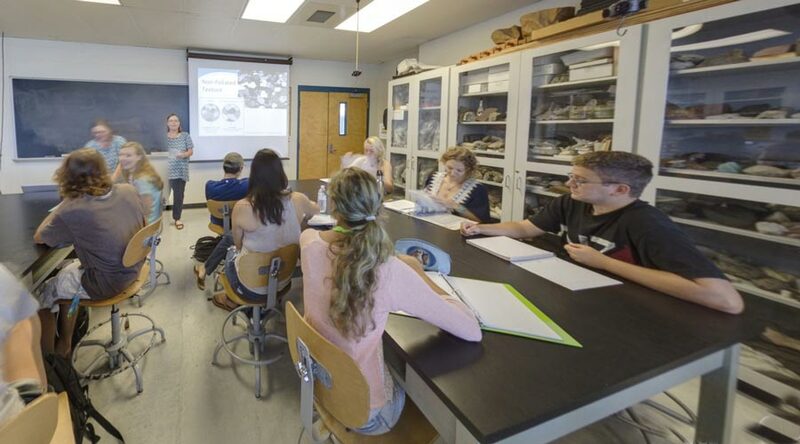 A class with Dr. Wetzel in Galbraith Marine Science Lab. Residence-hall courtyards are equipped with communal bike racks, picnic areas, outdoor charcoal barbecues and hammocks. Complex lounges offer full eat-in kitchens, which include stoves, microwaves, ovens, dishwashers and granite countertops. 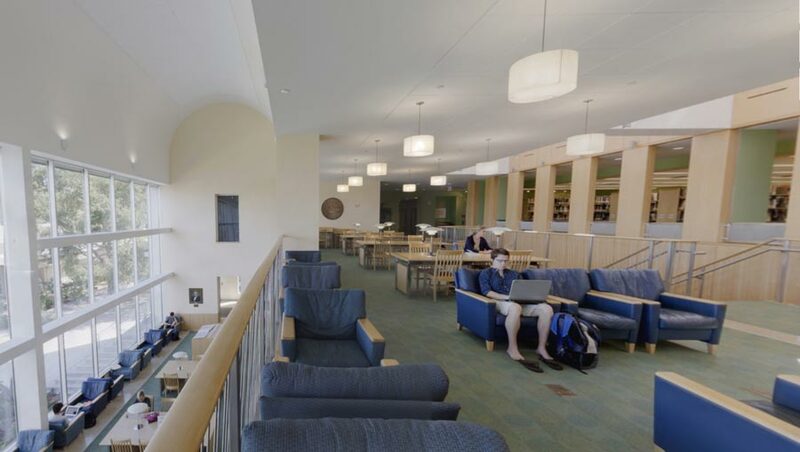 These communal areas make perfect spaces for studying or entertaining. 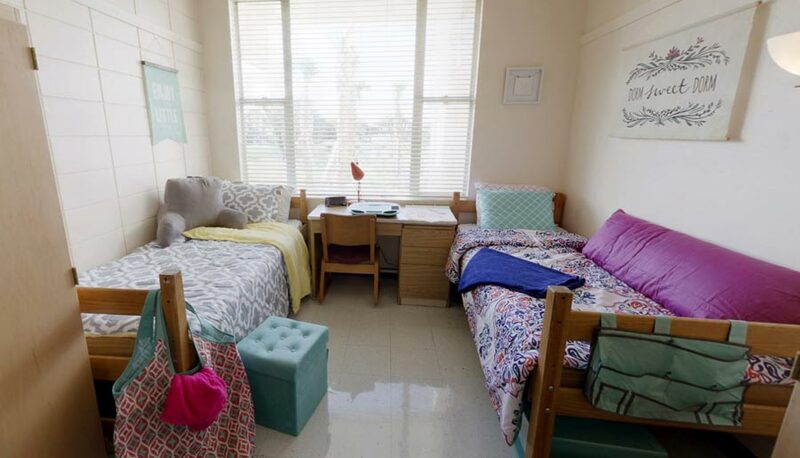 A "traditional" student room in the Zeta Complex comes with a gorgeous water view. Triton's Pub looks out onto Hough Quad, the heart of campus. Formally called Hough Center, the Quad is composed of Brown, Cobb, Edmundson, Fox and Lindsey Halls. 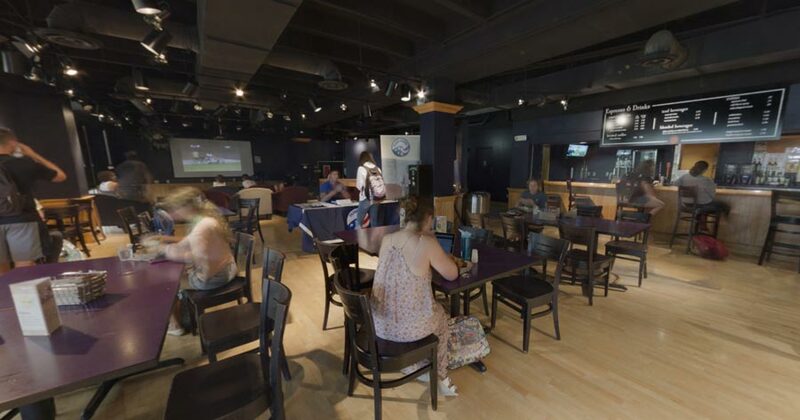 Triton's Pub offers large-screen TVs, pool tables and a stage for live music. Dining services include a hot grill, deli-wrap station, select soups, sandwiches and snacks as well as beer for patrons aged 21 and over. We have two full cafeterias on campus. Dedicated to serving fresh food, Café Bon Appétit purchases seasonal ingredients from small owner-operated farms and ranches within a 150-mile radius of campus and avoids meat and dairy from animals raised with artificial hormones or routine antibiotics. 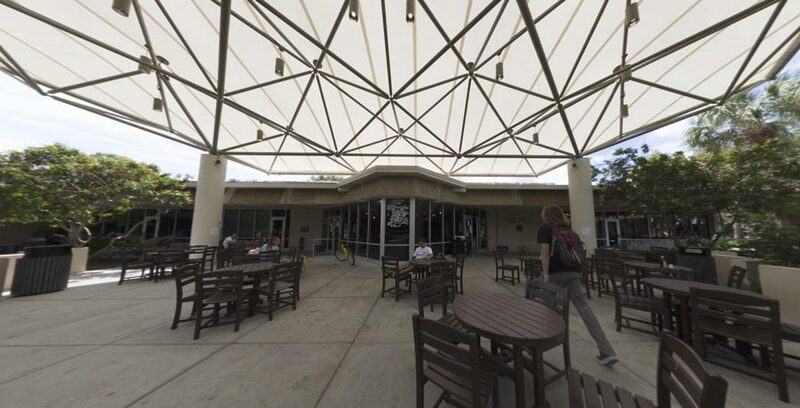 This is part of Eckerd’s commitment to sustainability. Outdoor cafeteria seating and planters; herbs and fruit grown in the planters are often included in meals here. 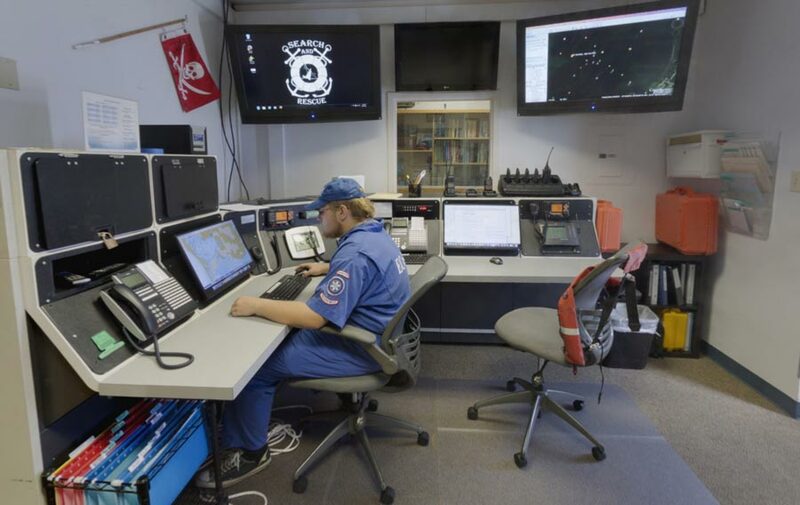 EC-SAR, the only collegiate volunteer​ ​maritime search and rescue ​organization in the U.S., offers assistance to boaters in Tampa Bay and surrounding waters. Responsibilities of the student-volunteers, who are on call 24/7, include towing, firefighting, searching for missing people or​​ ​overdue vessels, pulling vessels from aground, dewatering sinking vessels and performing medical rescues. 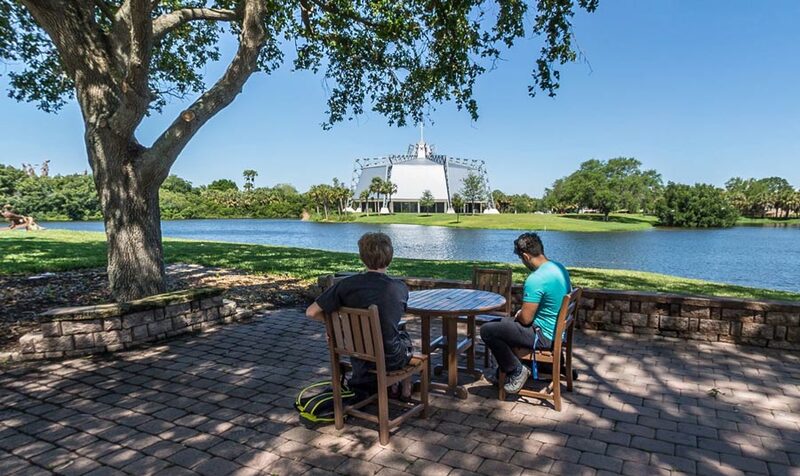 Wireman Chapel, on Fox Pond, is the focus of Eckerd"s commitment to the centrality of the life of the spirit, whatever form it takes, and its house of God, by whatever name He, or She, is called. 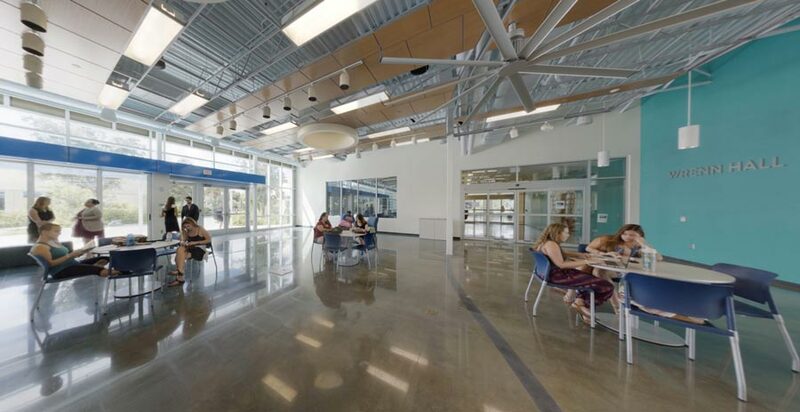 This sanctuary-in-the-round encourages connection through worship, artistic performance, education, annual baccalaureate services and more. 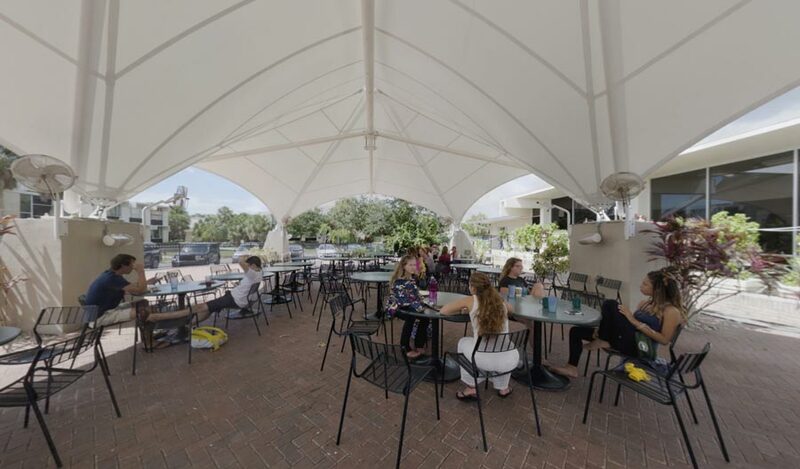 Wi-Fi–enabled, Eckerd's South Beach is a place to sit back, relax and unwind—especially by a glowing fire. 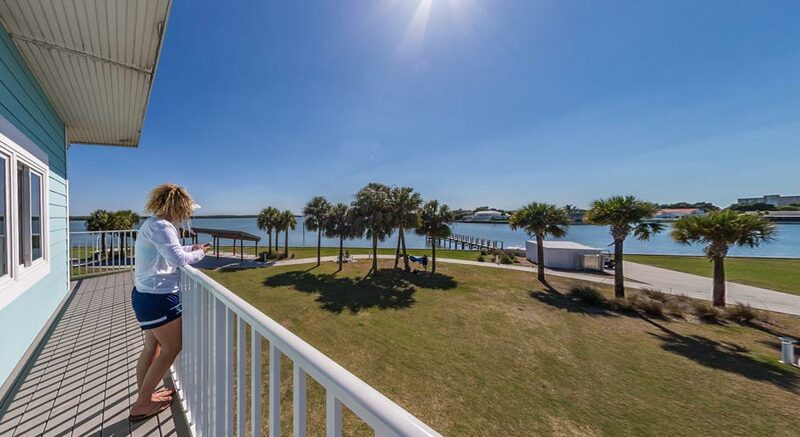 Recreation on the shore of Boca Ciega Bay is enjoyed by just about everyone, including pets. Fitness groups and clubs use the pavilion and outdoor exercise equipment regularly for workouts. South Field, also known as Kappa Field, is ideal for club sports such as Men’s and Women’s Rugby and Ultimate Frisbee. It's also a great spot for lounging in the Florida sun on a cloudless afternoon with friends and pets. 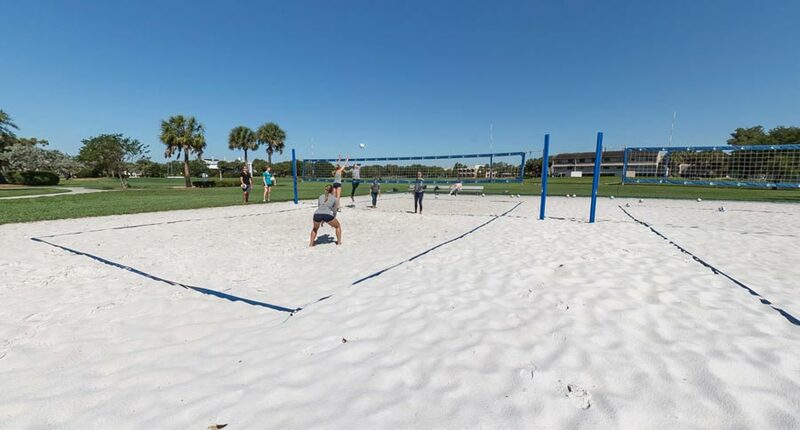 Home to the Eckerd College NCAA Division II Beach Volleyball team and situated next to South Beach, the two courts have easily adjustable–height nets and are used by varsity athletes as well as other students for recreational games. An outdoor shower next to the courts makes cleanup easy. 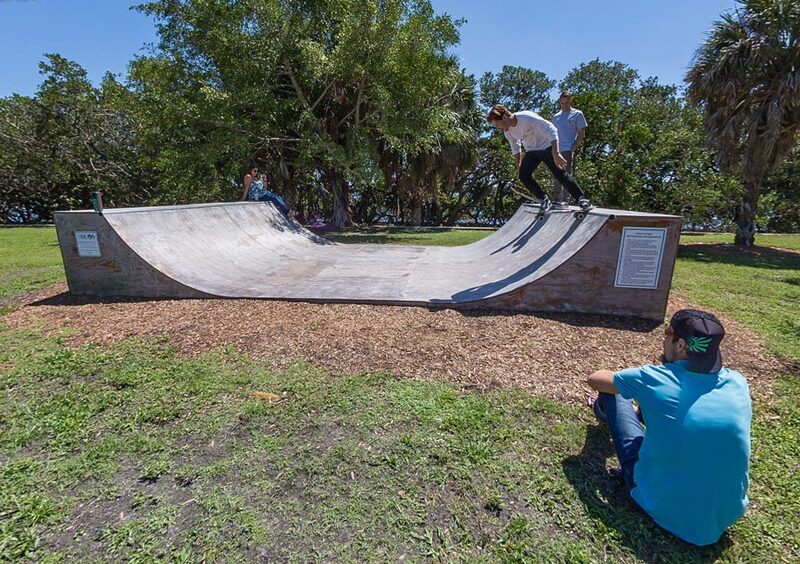 Located adjacent to South Beach, the skateboard ramp is 16 feet wide and 3.5 feet tall. It recently was fitted with Ramp Armor and decorated with a mural designed by our visual arts students. 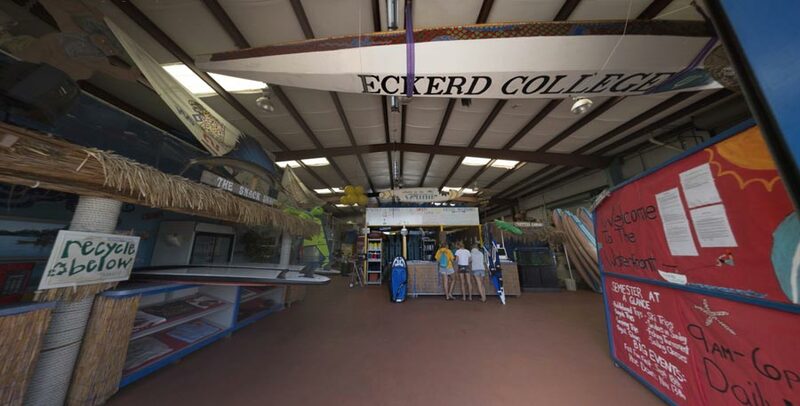 The docks on Frenchman's Creek are a prime location to launch your next water expedition, hang out with friends or find a soft breeze in the shade while you study for your next exam! The Waterfront Program offers students sailboats, paddleboards, canoes, kayaks, fishing gear, camping gear and more. Wakeboarding trips leave daily. Professors also take students onto Boca Ciega Bay by boat or kayak for class. Just bring your student ID and a towel! The Doyle Sailing Center is home to the College"s Coed and Women's Sailing teams. 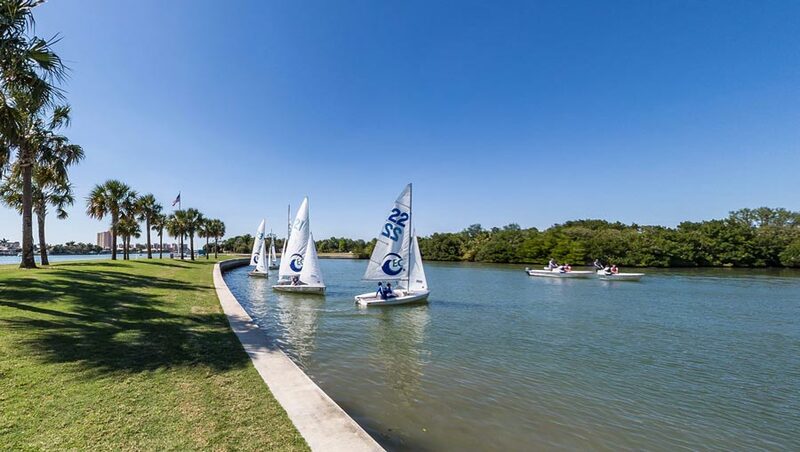 Student-sailors enjoy a floating dock system with 26 slips—one of the best, if not the best, in the country; easy access to Boca Ciega Bay, allowing first-class competitions and quality training time during practices; and a protected cove to respond with ease in Florida"s ever-changing weather. Sailing coaches have the perfect vantage point to monitor how the Sailing teams are performing from atop Hough Loft. GO Pavilion offers 10,000 square feet of open-air space for sports, concerts and other campus events like the annual Festival of Cultures. The outdoor pool, on the north side of campus, is open daily for students. It has a 12-foot deep end, six 25-yard swimming lanes and lounge equipment along the perimeter. The pool also hosts SCUBA training as well as many campus events and celebrations. With over 7,500 square feet of workout space, the fitness center offers free weights, machine weights, cardio machines, a group training room, kickboxing space and an aerobics/dance room with wood floors. [br] Student-taught fitness classes include yoga, weight training, spin, step, Zumba, stretching, Pilates, Ab Attack, CrossFit, Muay Thai, MMA and self-defense. 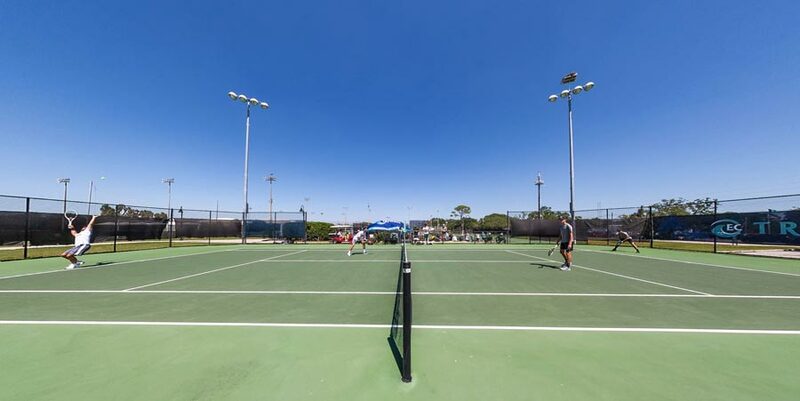 Six tennis courts, adjacent to the Johnson Athletic Field, are home to our NCAA Division II Men's and Women"s Tennis teams. The softball field is part of the Turley Athletic Complex and home to the Eckerd College NCAA Division II Softball team. 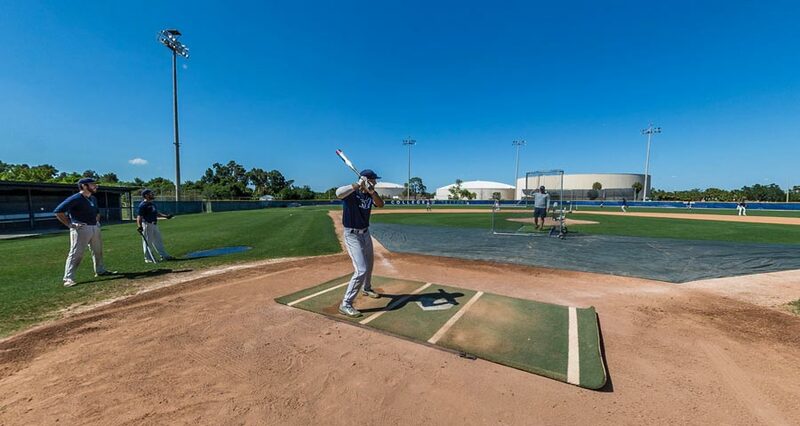 The baseball field, located on the east side of campus directly across from the Waterfront Complex, is home to the Eckerd College Baseball team, which has made 10 NCAA Division II national tournament appearances. The team fell to UC-Riverside in the 1977 championship game, 4–1. Field dimensions are 330 feet down the lines, 365 to the gaps and 400 to dead center. Dedicated to soccer, our lighted field boasts Sprint Turf—perfect for year-round varsity and intramural games. 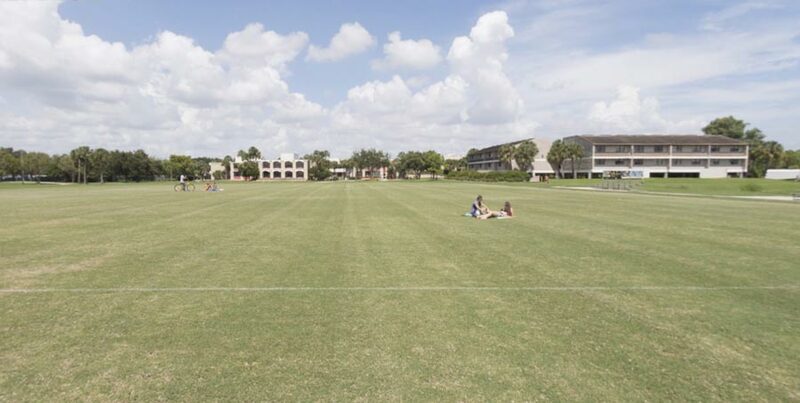 The field is home to the Eckerd College NCAA Division II Men's and Women's Soccer teams.